The Peacock Angel is the Crown Chakra, which is Illumination. The 7 rays, are the seven chakras. The Yezidis say he is the supreme God. Kether is what this is. When you become enlightened, you see peacock feathers. Again the stories and myths built up around this 'GOD' cause divsion and corruption. When really we should be allowed to know that we all have this within us, just waiting to be ignited. PEACOCK: A symbol which heralds the fact that transformation is occurring. 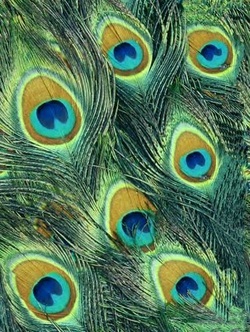 The brilliant colours of the peacock's tail (Cauda Pavonis) mark the beginning of the process of integration, the formation of Philosophic Mercury. The varied colours that arise during the course of the work which resemble the colours of petroleum on a wet surface.